David Cohen. Who's the Judge going to be, Kate? Kate Green. Judge Abraham Ginzberg. David. Ginzberg. Sounds good. What do you know about him? Kate. Absolutely nothing. I haven't been in Small Claims Court in five years. In fact, I don't know what I'm doing here today. What am I doing here today? David. I got stiffed at a gig. You're representing me. Kate. David Cohen, my criminals pay $250 an hour for my services. David. I'm not a criminal. Kate. What's that supposed to mean? David. It means I did piano at your wedding for gratis. Kate. You didn't do a very good job. It only lasted six months. David. Had you married me, it would have lasted longer. Piano players come with a one year warranty. Kate. (Ignoring him) How much are "we" suing for? David. $450. Well, actually $225. She offered to pay half. Kate. Let me get this straight. You got stiffed for $225? So you dragged me down here to represent you, and now you're planning to stiff me on my fee? David, this is going to take all morning! This is costing me $1000! David. It's a matter of principle! Mary O'Malley and her gaggle of Irish friends impugned my professional competence. Judge Ginzberg. (With an unmistakable Irish brogue) Court's again in session. Top o' the morning to you all. David. (Stage whisper to Kate) Why does a gay named Ginzberg have a brogue? Judge. Sure'n, you must be the plaintiff, David Cohen. (To Kate) And who might you be, darling? Kate. Kate Green, your Honor. Counsel for the plaintiff. Mary O'Malley. That's me, your Honor. David. (Whispers to Kate, a bit too loud) She didn't look that good at the wake. David. Her husband's. He "croaked." David. Died. It's Irish slang. I must have picked it up at the wake. Kate. You're suing a widow during her bereavement? Judge. You're suing a widow during her bereavement? Mary. What would you expect from a barbarian? Kate. I object to her calling my client a barbarian! He may be unfeeling and self-centered, but he's certainly not a barbarian! David. Thank God, you're representing me! COMEDY WITH TRADITIONAL IRISH MUSIC. Mary refuses to pay his agreed upon fee.. Enraged, David sues the widow and the two appear in Small Claims Court ready to battle it out. In order to prove his case, David brings along a piano to perform Irish songs for the judge. 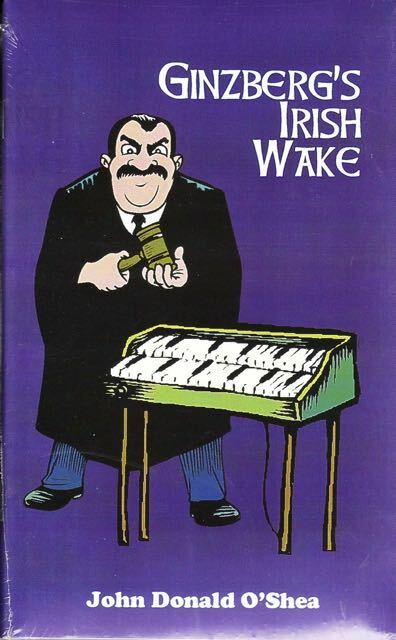 When the judge falls asleep during an Irish lullaby and then jumps to his feet to dance an Irish jig, David feels confident that he will win. Unintimidated, Mary defends herself by calling forth Father Shamus Rory Mulligan as her expert witness. Twists and turns abound in this hilarious play, which features five traditional Irish songs. Some years ago, my brother and I were out singing at a great piano bar in Barrington, IL. As we sat that, we struck up a conversation with an attractive woman and her husband who happened to be sitting there and who were singing with us. As we talked, the lady related a story of a married couple - her friends -- who had an annual backyard party. To entertain their guest, they hired the same pianist - "Charlie" - year after year. The pianist was "a guy who could plan any song any body could suggest." Unfortunately, he died, and the couple was forced to find a new pianist. The new guy represented he could play just like "old Charlie" had. When the night of the party came, the couple discovered to their dismay that the new pianist could only play with sheet music under his nose. At the end of the evening, the hostess confronted the new pianist and said "You misrepresented your abilities; I am only going to pay you half of what we agree!" The pianist replied, "I'll see you in court! "And that's where they next met. And with only a few embellishments, I created this little piece. A perfect play for St. Paddy's day. The Small Claims Court Room of the Hon. Abraham Ginzberg. The time is the present.